Baste the ham with glaze the last 15-20 minutes of baking. 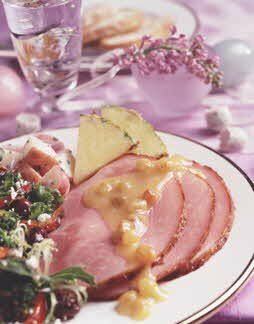 Remove ham from oven, slice and serve with Pineapple-Raisin Sauce. In a medium saucepan, sauté onion in butter until tender. Add remaining juice concentrate, water, raisins, maple syrup and mustard. Stir together 1/4 cup vinegar and cornstarch; stir into raisin mixture. Treat your Easter guests with this glazed ham. Top with the pineapple-raisin sauce and serve with new potatoes and your favorite springtime salads.